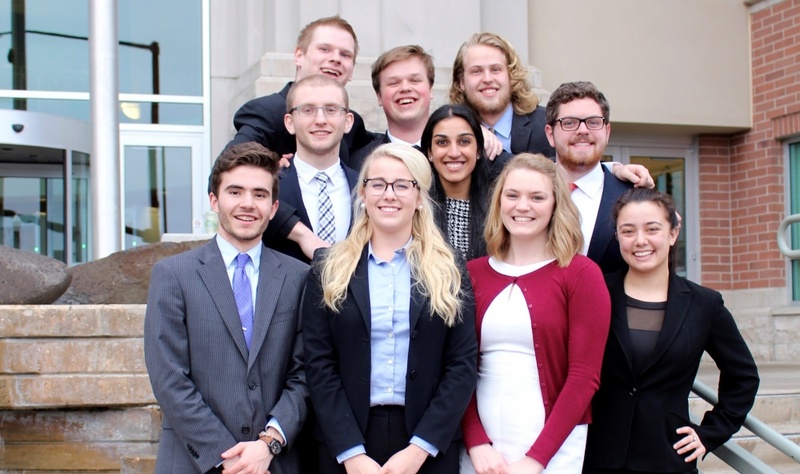 The UO Mock Trial team recently wrapped up its most successful season to date, placing 10th in its division and 19th overall out of 48 teams at the National Championship Tournament of the American Mock Trial Association. The tournament, held April 15-17 in South Carolina, was the team’s first time at nationals. More than 600 collegiate mock trial teams started the competitive season, and only 48 teams advanced to the national championship. Among the top 10 percent of teams nationally, UO Mock Trial was in prestigious company in South Carolina, including such seasoned competitors as Stanford, Harvard, Berkeley and Cornell. Mock trial was founded in 2010 and fielded a team for their first formal competition in 2012. Since then the program has advanced rapidly, participating in its first invitational tournament in 2014, followed closely by placement at regional championships that same year. Recently, the program has been assigned to the nationally recognized forensics speech and debate program under the Robert D. Clark Honors College. With this partnership, mock trial members are able to receive academic credit. Joining mock trial with the forensics program has been game-changing. “(The partnership) helps us with funding, yes, but also helps us get invited to invitational tournaments like Stanford and UCLA,” Mina said. Most mock trial teams are “pay-to-play,” meaning students pay their own way. At Oregon, the forensics program funds team initiatives so that everyone with the chops can compete regardless of financial situation. Learn more about mock trial at the University of Oregon at http://uomocktrial.com.